As if being transported more than 1,300 miles to New York from Turks and Caicos isn't stressful enough for an unsuspecting 4-month-old puppy that doesn't realize he's headed for safety of the world's largest no-kill animal rescue and adoption organization, consider that same puppy has two severely injured hind legs, one so badly maimed from an apparent hit by car that his knee cap was completely shattered beyond repair and an entire layer of skin and flesh were peeled from the bone. For Tyson, a beautifully docile pointer mix who recently arrived at North Shore Animal League America by way of an international rescue transport, life has proven to be quite the uphill battle. In addition to the gruesome injuries to his hind legs, the doe-eyed puppy was also suspected of having a fractured pelvis, and it was apparent by the scarring on his legs that his injuries occurred at least a month before he arrived at the Port Washington, NY facility from a tiny shelter on the island, so diagnosing and treating them proved more complicated than expected. "Unfortunately, Tyson has substantial damage to his left knee. The knee cap is obliterated, which means he essentially has no knee cap, and in order for the knee to function properly you need a knee cap. It's unlikely this is a repairable issue, so he may end up losing the limb if we can't make it functional. Of course we'll consult with the orthopedic surgeons at the AMC before making any decisions," said Dr. Verdino. "Three of the four bones in his foot on the other hind leg are also broken and they appear to be healing abnormally. It's unfortunate because if this winds up being his only remaining hind leg he'd be baring all of his weight on an abnormal foot." With the deck seemingly stacked against Tyson at such a young age, one would think he'd be guarded or even aggressive, but that couldn't be further from the truth. This adorable pup is more affectionate and mushy than he is aware of the dire situation that's been thrust upon him. Despite finding it difficult to support himself on his injured hind legs during his examination with Dr. Verdino, Tyson didn't miss the opportunity to gingerly place himself in the doctor's face to show a little puppy appreciation with some wet kisses. Veterinarians at North Shore Animal League America did all they could to save Tyson's severely injured left hind leg, but like expected, it couldn't be salvaged. 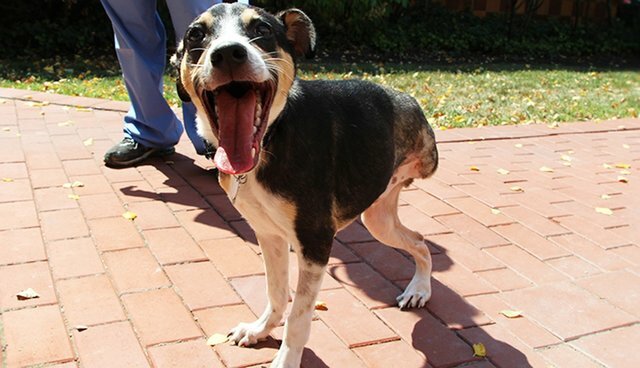 The knee cap was so destroyed and the leg was so maimed that doctors deemed the young pup would have a better quality of life if the leg was removed. Tyson's post-surgery rehabilitation has gone so well that the beautiful pointer mix has been approved for adoption and he's ready to find a loving home! Despite his handicap Tyson is a very playful, energetic puppy, and gets around quite well, so he'll make some lucky adopter's life complete. Animal League America behavior specialists do suggest he go to a home with children 10 years and up because he is still a puppy and very energetic. He also loves to play and interact with other dogs, but a meet-and-greet will be required due to his medical circumstance. "Tyson is everything you'd want from a puppy. He's playful and very affectionate. You'd never know all he's gone through if you didn't see it," said Foster Care Manager Tara Guclu. "Watching him during his recovery has been really gratifying. He's come such a long way from when he first arrived here." If you'd like to make Tyson a member of your family, please contact Foster Care Manager Tara Guclu at 516-883-7900 extension 352 or tarag@animalleague.org.